To fully understand what the Global Open Forums are, we should begin with an understanding of what the Global Open Forums are not. First, a Global Open Forum is not a Mini-General Assembly. No motions concerning any subject will be formulated, nor decisions adopted in these sessions. While I will personally host and direct the sessions, Roberts Rules of Order will not be used. Obviously, time restrictions will need to be imposed on speeches in order to allow for all to have opportunity to address the topics. Of course, Christian and courteous decorum will be expected of all participants. An explanation of our procedure will be given at the beginning of each session to insure everyone’s understanding of protocol. Second, the Global Ministry Forums are not the Executive Committee’s attempt at persuasion on the topics. As with any topic of discussion, the members of the Executive Committee have opinions and naturally, in most instances, it’s difficult to speak without those opinions coming forth. However, the Global Open Forums are not the EC’s “traveling road show” for the purpose of promoting an agenda. Rather, the forums are your opportunity to “speak into the process” and assist the Executive Council in studying scripture, praying fervently, and offering insight to some questions that have been a concern to the church for a while. My commitment is to host the conversation in such a way as to be fair and respectful to every individual and opinion. At the beginning of each session, I will briefly and concisely present an overview of each stated topic in order to establish the subject and hopefully begin healthy conversation among those participating. I promise you that beyond necessary opening instructions, all of the time allotted to the forums will be spent in hearing from those in attendance. There will be no department promotions or hallway exhibits. The forums are built to be very focused and arranged for leadership to hear from the hearts of our laity and ministers in each location. Fourth, the Global Open Forums will not be the Perfect Format. The Executive Committee has looked at numerous ways to carry out the General Assembly-mandated Global Ministry Forums. There is no perfect way to do these and connect with every demographic nuance. None of them will be as long as any of us wish. While we have attempted to provide a broad schedule allowing for maximum participation, we will still miss many who simply can’t adjust their own schedules to attend. We have discussed everything from room logistics to media and technology. We have wrestled with the best locations, starting and ending time, WiFi availability, traffic issues, you name it. Bottom line – the forums are what they are. Pardon me, but this “ain’t” Camp Meeting, Catalyst, an ARC gathering, or anything that will look like Elevation or Hillsong. I’m not preaching, the Youth Choir’s not singing, and the Drama Team isn’t dancing. The forums are solely for the purpose of hearing from our people and collecting thoughts, insights and even data that will assist the Executive Council in its preparation of a General Council agenda for 2020. Finally, the Global Open Forums are not a Waste of Time and Money. While each forum is designed to last for three hours, if those participating so desire and if merited by strong levels of interest, I will certainly allow for more time for discussion. With twenty-three forums, that’s almost 70 hours of crucial discussion that will be hugely beneficial to the process. Possibly the most important aspect of the forums is the survey that will be available. Time will be taken in each forum to complete the survey. 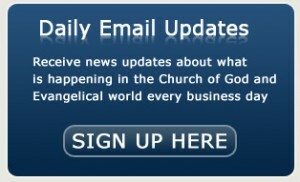 However, the survey is available online (www.globalministryforums.com) and can be completed at any time. The success of the forums will not be judged by any decisions made at the next General Assembly. The success, or failure, of the forums will be determined twenty-three different times over the next year. If the issues are clearly articulated, if the discussion is free, open and respectful, if iron truly sharpens iron and we walk away not necessarily seeing eye-to-eye, but walking hand-in-hand, then the forums will be successful. If as a host I can insure a “safe” zone of where unhindered and honest dialogue and forward-thinking ideas are welcomed, then the forums will be a success. This is my hope and intent. The General Assembly believed that this process would be the best way to get participation from the widest cross-section of our church. Hopefully, those who cannot attend will be able to participate in the Internet Livestream Forum planned for April 26. I hope that you will take time to attend and participate in the forum nearest you. I’m looking forward to seeing you.